Taiwanese electronics maker Asus has today announced its new line of ultrabooks that fall in its Zenbook range. The company had rolled out its Asus Zenbook 15, Zenbook 14 and Zenbook 13 laptops during the IFA 2018 in Berlin. And after months of wait, the company has launched these laptops in India. Asus Zenbook 13 features a 13.3-inch Full HD LED Backlit Wideview NanoEdge Display that offers users a bezel-less screen experience and is equipped with the company’s Splendid technology and Tru2Life Video technology. According to Asus, the two technologies tweak the colours projected on the screen to their real nature. In addition to this, the laptop also comes with an ErgoLift Hinge which can be used to tilt the keyboard to a position that is comfortable for the user. Asus Zenbook 13 weighs 1.19 kgs and is powered by the 8th generation Intel Core i5 or i7 processors coupled with up to 8GB RAM and 512GB of SSD storage. The device can be purchased with NVIDIA Geforce MX150 and runs Windows 10 Home 64-bit OS. For connectivity, there is an HDMI Port, a USB 2.0 port, a USB 3.1 port and a USB 3.1 Type C. The laptop also has support for Wi-Fi, ASUS Wi-Fi Master technology and Bluetooth 5.0. Asus Zenbook 14 sports a 14-inch Full HD LED Backlit Wideview NanoEdge Display that comes with a resolution of 1920×1080 pixels. It also comes with an ErgoLift Hinge which can be used to tilt the keyboard to a comfortable position when opening the display. 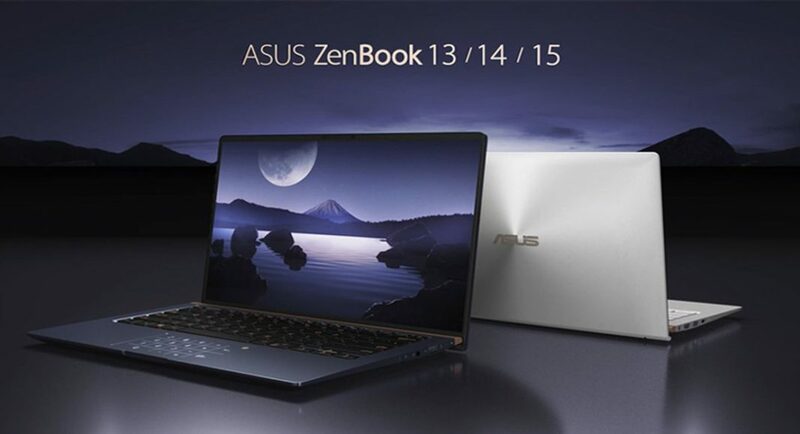 Asus Zenbook 14 comes with improved cooling and enhanced audio performance. The laptop is powered by the 8th generation Intel Core i7 processor with up to 8GB RAM and 512GB of SSD storage. The device runs Windows 10 Home and its connectivity options include a USB 2.0 port, a USB 3.1 port, a USB 3.1 Type C port, an HDMI port a microSD card, Wi-Fi, and Bluetooth 5.0. Speaking of Asus Zenbook 15, it comes with a 15.6-inch Full HD LED Backlit Wideview NanoEdge Display that has a resolution of 1920×1080 pixels and weighs 1.67 kgs. The laptop is powered by an Intel Core i7 processor with NVIDEA GTX 1050 MaxQ coupled with 16GB of RAM and 1TB of SSD storage. The laptop, like Zenbook 13 and Zenbook 14, comes with the ErgoLift Hinge and its connectivity options include a USB 2.0 port, a USB 3.1 port, a USB 3.1 Type C port, an HDMI port, a microSD card reader, Wi-Fi and Bluetooth 5.0.